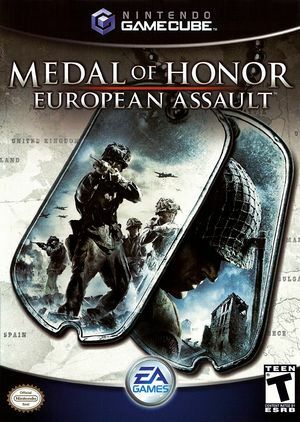 In Medal of Honor: European Assault, you'll join the effort to liberate Europe in 1942. As US Army Lieutenant William Holt, you must take command of a group of soldiers through battlefields based on actual WWII locations. In both single-player and multiplayer modes, your survival depends on your ability to master weapons, gather intelligence for future missions, and make smart choices. Medal of Honor: European Assault uses the VP6 video codec, common in Electronic Arts' titles, causing it's videos to have vertical line artifacts and other glitches on NVIDIA graphics cards. The Software Render will display VP6 video correctly, but is typically too slow. Prior to 4.0-593 video output was completely scrambled, refer issue 5046. Rendering improved with 4.0-593 but a variety of glitches remain, refer issue 7193. VP6 rendering also reacts poorly to the Force Texture Filtering enhancements (and Anisotropic Filtering on NVIDIA), causing further scrambling. Some objects will be culled from the scene too early when using Dophin's Widescreen Hack. This Action Replay (AR) code will correct that when used with the hack. The graph below charts the compatibility with Medal of Honor: European Assault since Dolphin's 2.0 release, listing revisions only where a compatibility change occurred. This page was last edited on 27 February 2018, at 10:51.